The first fully functional prototype of the monitoring device, FarrowCam1, has recently been made. It features a thermographic camera, a battery, and a processing unit running FarrowTech’s algorithm for detection of piglet births. Everything is enclosed in a 3D-printed, watertight box with buttons, LEDs, and two displays showing the number of piglets born and the time since last birth. The prototype will be tested in several farms in order to quantify the value proposition, provide us with valuable feedback from users, and to improve the algorithm. 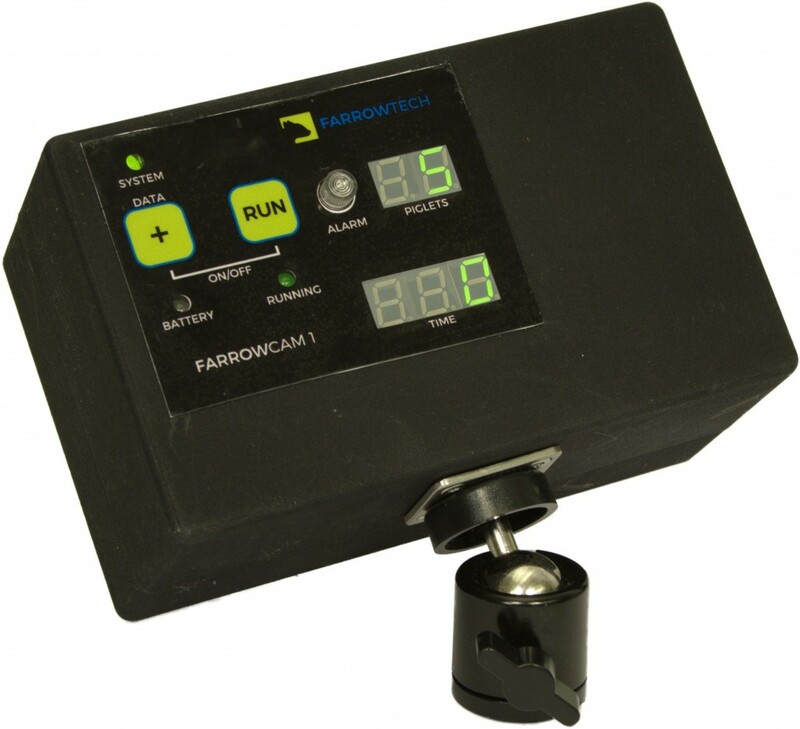 FarrowTech’s first fully functional prototype, FarrowCam1. Movie of the FarrowCam1 in action at the farrowing pen. When the movie starts, the displays of the device show a total number of 11 piglets born with the latest birth four minutes ago. Three seconds into the movie, a new piglet is born, and few seconds later, the displayed number of piglets increases to 12 while the time since last birth is set to zero. Detecting the birth of a piglet by computer vision is a complicated task due to the presence of other live and dead piglets behind the sow, fixtures of the pen limiting the camera view, and low light levels. FarrowTech has developed a patent-pending technology for detection of piglet births using the fact that a newborn piglet is warmer than the surroundings, and using thermography, it is possible to get a clear signal from a newborn piglet, even if it is only partly visible in an image. This is illustrated in the montage below. Montage of false-color thermographic movie images of a piglet birth at different times t.
FarrowTech has developed an algorithm for automated detection of piglet births in thermographic images. The movie below shows an examble of what it is able to do. FarrowTech’s algorithm analyzing a thermographic movie of farrowing sow. Note how the number of piglets born is counted in the upper left corner. Movie speed increased by a factor of 12.